As the central-bank-orchestrated “recovery” sputters out, the evidence of sustainable policy efficacy is clear. You can bloat a lot of things by stuffing them with liquidity, force-feeding cash into markets, but it works less and less over time and the price you eventually pay to do so gets steeper and steeper. But this late into the game, central banks are married to debt issuance. To admit a significant change in course is warranted is to admit what they have done so far has been a travesty building to a tragedy. Of course, those paying attention to the data already knew this. Our politicians and central planners have been peddling to us the fantasy that the global economy is strengthening, finally ready to fire on all cylinders after nearly ten years of dependence on monetary stimulus. 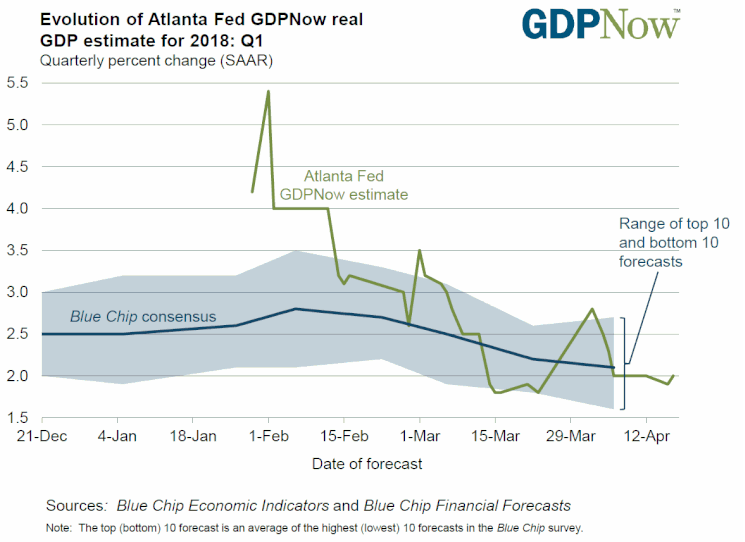 The Federal Reserve of Atlanta's GDPNow measure, which gives a forecast of Q1 2018's expected GDP, is currently coming in at 2.0%, down from the much more vigorous 5.4% growth predicted as recently as early February. Rising interest rates will only accelerate the advance of a recession. And interest rates are indeed on the rise, with 10-year Treasury yields having nearly doubled since July 2016. And with the arrival of recession, what will our leadership do? The only thing it knows how: print, borrow and deficit spend in attempt to boost 'growth'. Except the debt will be even more expensive this time, and its ability to generate incremental growth per unit of new debt even weaker.